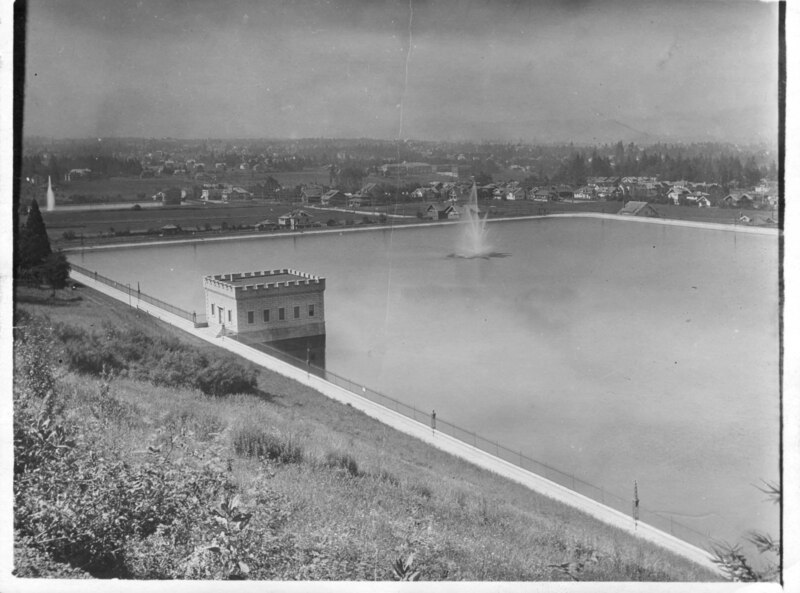 The final part of our series on Reservoir #6 shows it complete and operational in 1916. The east-west divider wall is not visible in this photo but it separates the reservoir into north and south basins; only one is filled at a time. Water pressure from Reservoir #5 just uphill feeds the fountain in the active basin. Reservoir 2 is also visible in the background, The reservoir is no longer there, but the gatehouse still exists on the NE corner of Division and 60th. Very neat pic. I used to live right off of 60th & SE Stephens St, which parallels the southern edge of Reservoir # 6. Looks so desolate back then. You can see Franklin High School in the upper- middle of this image as well. Everytime I drive by that old gatehouse for reservoir # 2, I think what a quaint little bar or cafe it could be turned into. surplus park property “openly,” at least they would not have to make good on their threat to move to another locaton, maybe out of town. Great series, Dan, You have surpassed yourself and become a great story teller, as well as a gifted archivist. I have thoroughly enjoyed each addition to this series of photos. Thanks again! Ian – Thanks for the kind words!